Starting December 6, the fiber internet provider will initiate upgrading the speeds of existing internet subscribers for free. In the new pricing strategy, Converge ICT subscribers of the 50 and 100 Mbps plans will receive a free upgrade to 75 and 120 Mbps, respectively. These speed upgrade will automatically be effective starting December 6, 2018. Alongside this free upgrade, an add-on speed, called FiberX 1500Plus is offered to all existing for only P99 pesos, the existing subscriber can avail of an additional 10Mbps Speeds. 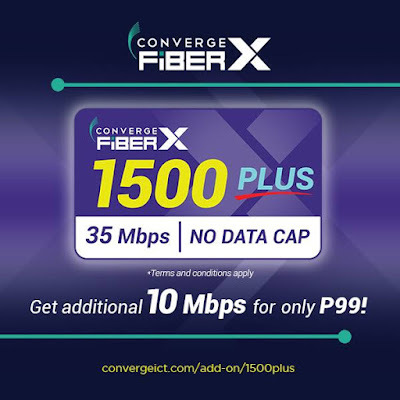 And to give more excitement Converge ICT is giving the add-on speed FREE for 1-month for all its 1500 existing subscribers who will avail until January 31, 2019.